On September 20th, when the catchy panda logo and the delightful panda figure appeared together at Patan Durbar Square in Nepal, local crowds flocked to the spectacle. On that day, the “Beautiful China, More than Pandas” Sichuan tourism promotional campaign, which was hosted by the China National Tourism Administration and organized by the Sichuan Tourism Administration, officially kicked off to bring to local travel enthusiasts the highlights of tourism in Sichuan and the latest information on new routes. As one of the few cities with a non-stop flight to Nepal, Chengdu has established a convenient passage for traveling to Sichuan and thus has generated increasing attention. As a “mecca” among backpackers around the globe, Patan Durbar Square is packed with tourists year round. But unlike other times, on September 20th, the delightful panda figure, creative little panda paintings and a large number of exquisite panda elements appeared at the cafe in the Patan Palace, bringing to this “outdoor museum” an exotic flair. At the DIY panda painting zone especially set up for the activity, the adorable white panda models and the vivid palettes of paints attracted participation from huge groups of locals and students eager to express their creativity and imagination through decorating the plain pandas with their own color schemes. Following the emergence of giant pandas that embody both the qualities of Nepal and Sichuan, an even bigger crowd arrived to see the creations and the area was filled to the brim in a lively ambiance. The Sichuan tourism promotional materials and giant panda soft toys, hand fans, scarves, umbrellas, toiletry bags, insulated beverage containers and other innovative yet practical memorabilia manifesting the activity theme became items sought after by everyone. Many passer-bys spent a moment to enjoy the atmosphere and to take pictures with the panda figures. Other than panda elements, food is also another hallmark of Sichuan tourism. On September 21st, the Sichuan Vegetarian Cuisine in Land of Buddhism – Lumpini Tasting Activity was held at the Buddhamaya Garden Hotel. The “One Leaf One World” Tibetan tea and vegan hot pot restaurant from Sichuan provided vegan hot pot, while dishes after dishes of Sichuan culinary delights prepared by local chefs were laid out at the activity site, immaculately combining Buddhism culture and Sichuan vegetarian foods that are pleasing to all the senses. This vegan hot pot is inspired by the motto “one flower one world, one leaf one Gotama Buddha,” and uses quzhen Tibetan tea from the rainy city of Ya’an as the secret ingredient for the soup base. This hot pot recipe preserves the bouquet and medicinal functions of the tea and fully exhibits the benevolent and merciful principles in vegan diet. The hot pots were praised by tourists and locals alike and they all expressed the desire to go to Sichuanto try out even more delicious Buddhist cooking. In recent years, mutual visits of high-ranking officials and personnel between Sichuan Province and Nepal have increased in frequency, while cooperation in areas like economy, trade, agriculture, education and culture have produced laudable results, and on numerous occasions Nepalese decision-makers like Prime Minister “Prachanda” Pushpa Kamal Dahal have also visited Sichuan. Using panda and food as highlights, this promo campaign served to enhance the image of Sichuan tourism in a process that was filled with fun and excitement. The event was reported by almost 130 Chinese and foreign media including The Himalayan Times, Kantipur News Channel, The Rising Nepal, People’s Daily online, Tencent and Sina, successfully instigating a wave of popularity in Sichuan tourism. In addition, worth mentioning is that as an integral part of the “Beautiful China, More than Pandas” Sichuan tourism global promotional campaign, this time the “entering famous university” panda fans recruitment activity entered Kathmandu University, and through online sign-up and on-site recruitment, a total of eight panda fans were added to the ranks. The fans of panda will have the chance to head to Sichuan to tour the Panda Base and learn relevant knowledge such as how to feed, breed, rescue and train pandas, as well as preparing a meal for the giant pandas and feeding them in person. Also, the fans of the panda will learn to clean up panda habitats and help create a comfortable environment for the animals. 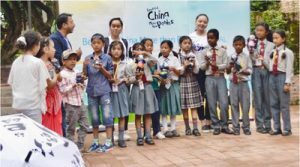 Industry professionals pointed out that these fans of panda recruitment activity will enable more Nepalese to learn about China through the adorable giant pandas, while at the same time also attracting the new generation of knowledgeable Nepalese youths in coming to Sichuan to see and experience a beautiful China.